It’s winter. Though we’re not yet through with summer business, when I look out the window, that blanket of white is pretty convincing. Though temperatures have been pretty mild, there’s no doubt that the season is upon us. We don’t mind winter. It slows things down. And we love the cozy-evenings-with-a-fire-in-the-woodstove part. We’ve not yet reached the coldest part of winter, where a fire is needed round the clock. I’m largely responsible for keeping the woodbin stocked from the woodpile. And I chop most of the kindling. That’s the only part I don’t much like. Admittedly, I’m not what anyone would call graceful or coordinated. Swinging a sharp hatchet near my fingers and thumbs makes me nervous. I’ve been eyeing those ads for a “kindling cracker,” a handy device for holding firewood whilst splitting it in a near-effortless, and finger-safe, procedure. They’re ingenious, and elegant, but not cheap. I’ve been considering it for a couple of years; it’s a woodburning accessory that I could almost convince myself is a safety necessity. As is often the case when it comes to Northern living, I thought I’d ask my sister—who’s several hundred miles north of me—and has heated with wood for her entire adult life. She laughed. “Not ‘for the season.’ We start a fire in October. Then it burns until May, 24/7. And you? And that, was that. Surely she’ll be of no help in my consumer decision. I’m not entirely sure if it was as cut and dried as all that. I could be the victim of Northern snobbery. But I’ll never know. There are probably a hundred things that we could have done today—some maybe more important than what we actually tackled. But, there is a special lure to a new toy, though. You just gotta try it out. We’ve had cut wood sitting in the forest for some weeks now. Not that it matters; the firewood could sit there until fall. 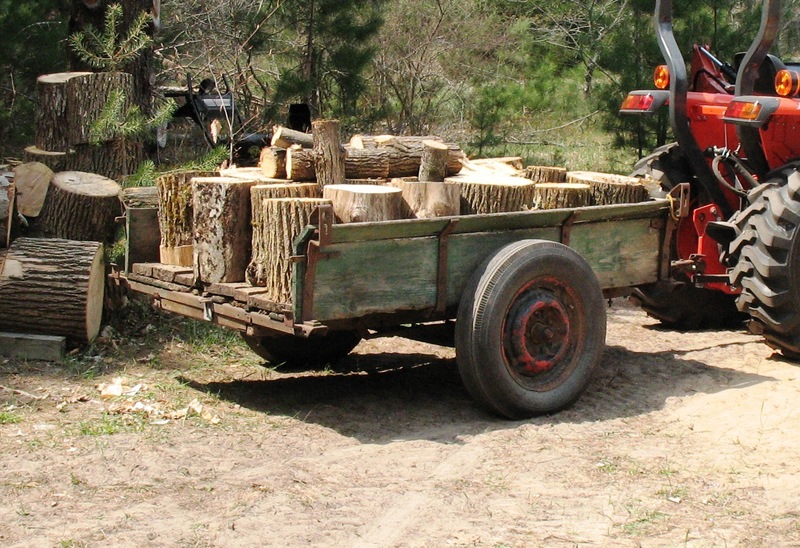 The problem was that, though we’ve cut the trails, we did not have a trailer to haul the wood out. I’ve been perusing craigslist for weeks. Trailers are not cheap! Who knew? It needed to be small, to handle our steep terrain and tight turns. It did not need to be road-worthy. By that I mean that we didn’t need lights or brakes. We will never use this trailer off the property. And, we’re not likely to gather firewood in the dark. I mentioned sometime back that I’m a bit of a scrounge. Indeed, I may be the Queen of Scrounge. Finally, last week we found the perfect trailer. It’s really junky! For some reason, that makes me love it all the more. The old metal frame is rusty, but it’s sound. The wood is a mess, but that can be replaced. This is probably an old military trailer. I guess we’ll refurbish it—though I kind of like it just as it is. Rick is just as enthused, in a more subdued kind of way. Today was our first free day where we didn’t have to be doing something else. Rick was itching to try out the trailer. So, we decided to bring in some of the cut wood. Our funny little trailer worked like a champ. We brought in five trailer loads (plus what we could fit in the tractor’s loader.) Naturally, it turned out to be the hottest day so far this year—well into the eighties. It’s not ideal weather for the heavy lifting in this task. Still, off we went. We’re as happy as clams, though a little tired. Now that so much wood has been brought down to the home site, I guess we’ll have to split and stack it. There’s more up there, but we’ve run out of room at the splitting station. Everything in it’s time…and then, we can go play in the hills again.